LET ME GIVE YOU BACK YOUR LIFE BY TAKING OVER THE DOMESTIC DUTIES YOU DON'T HAVE TIME FOR. All of Auckland & surrounds. WE ARE MUCH MORE THAN JUST CLEANERS. ALL SERVICES ARE CUSTOMISED TO MEET EACH CLIENTS NEEDS. Irene Palmer: Thanks Nikki, much appreciated & I love working for you & your family. Always great to see a hard working & loving family making the most out of life. Irene has totally sorted out our home. We are completely hooked. On Thursdays we come home to an impeccably cleaned (and tidied) home. It's the little things that makes her amazing./ Last week she sorted out all my daughters clothes into the right ages and tidied all her drawers (without even mentioning it). I know we would be lost without her. I would highly recommend. Thanks Irene. Irene and the team have done a great job, many thanks. I can't recommend this company enough. Irene put huge amounts of thought into who would be the right member of her team for us and we have a great relationship with the person who comes each week to transform the house. We couldn't do what we do without her help. There are so many little extra touches too and that makes all the difference. This is a company that provide really bespoke care. They're brilliant. Irene Palmer: Thank you so much & I'll certainly pass this onto Christine. We love caring for you & doing what we can to make a difference. Very much appreciate your kind words. Irene and her team are incredible in fact they are fairy god mothers! I have had a few home help experiences and Irene is by far the best. Her professionalism, ability to think critically and foresee solutions just makes life easy. I trust Irene explicitly and highly recommend her service. Irene you and the team are doing a wonderful job and I can truly say I have my life back. Thank you. Irene Palmer: Thank you so much Char.... I love what I do & it is extra enjoyable when I get lovely feed back. Very appreciated. I have engaged Irene this year and have found her to be a truly wonderful. Irene is forward thinking, 100% reliable and thorough. I would highly recommend her services. Irene Palmer: Thanks so much Tanya. Wonderful to help with the new house also. Looks awesome. I have known Irene for over 20 years. She is a real professional, passionate about her business, and always takes much pride in her work. If you want someone who is capable, highly organised, fun and enthusiastic and extremely expert at what she does, go no further! We love Irene! Being a busy professional couple with a young child, Irene's help is invaluable to allow us the precious time to spend with our son instead of having to cook dinner in the evenings! And, it's really nice coming home to a tidy house without having to lift a finger. Her food is extrememly scrummy! Irene is extremely trustworthy, and has her own key to let herself in and out. Take the plunge - you won't regret it! Irene Palmer: Thankyou for those lovely words. Pork Loin with spicey apple tonight. & loads of crackling. Enjoy. Irene Palmer: Wow. Thankyou. I love looking after your beautiful family. Irene Palmer: wow! thank you so much for such an awesome reference. I'm looking forward to your next adventure. I have known Irene for many years and have always found her to be extremely reliable, organised, trustworthy and hard working. There is no job that is too big or too small for her to manage. She is a fabulous chef, a caring person and geniune all round decent person. I would recommend her without hesitation. Irene Palmer: Thankyou for your kind words. Irene is reliable, honest, hardworking, great with kids and adults alike. 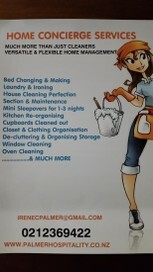 She is fantastic at budgeting and immaculate at tidyness, fantastic chef and great orgoniser. I would highly recommend her for any job. Irene Palmer: Thank you Farao. Maybe we will work in the same area again one day. all the best. Irene is extremely capable and honest. very good at budgeting and is mindfull of others. I would recommend her looking after your house and family. Irene Palmer: Thank you. Much appreciated.